1. van der Meij, Leander, Abraham P. Buunk, and Alicia Salvador. “Contact with attractive women affects the release of cortisol in men.” Hormones and behavior58, no. 3 (2010): 501-505. Previous studies have shown that situations relevant for human mating can affect the levels of many hormones. 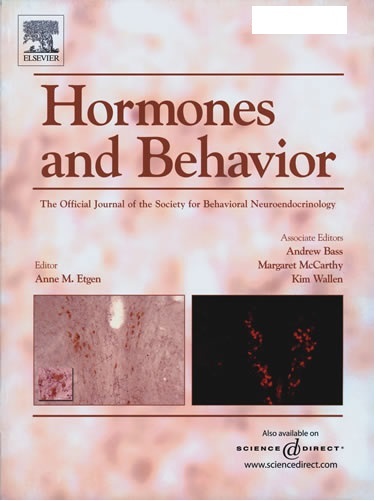 This study focused on the hypothalamus–pituitary–adrenal axis by measuring salivary cortisol levels in 84 young men prior to and after a period of short social contact with a woman or man. Results showed that after contact with another man the cortisol levels of the participants declined according to the circadian release pattern of cortisol. However, cortisol levels in men declined less when they had contact with a woman. Furthermore, cortisol levels of men increased when they perceived the woman with whom they had contact as attractive. Our findings provide indirect evidence for the role of the hypothalamus–pituitary–adrenal axis in human courtship. During social contact with attractive women, moderate increases in cortisol levels may reflect apprehension over an opportunity for courtship. 2. van der Meij, Leander, Abraham P. Buunk, Johannes P. van de Sande, and Alicia Salvador. “The presence of a woman increases testosterone in aggressive dominant men.” Hormones and Behavior 54, no. 5 (2008): 640-644. In line with the challenge hypothesis, this study investigated the effects of the presence of a woman on the testosterone (T) levels of young men. An informal contact with a woman of approximately 5 min resulted in an increase in salivary T among men. These effects occurred particularly in men with an aggressive dominant personality. In addition, higher salivary T levels were related to a more aggressively dominant personality, being sexual inactive for a month or more, and not being involved in a committed, romantic relationship. The most important findings of this study are that the short presence of a woman induces specific hormonal reactions in men, and that these effects are stronger for aggressively dominant men.